Using a food process, make a thick paste of the red onion, chili, garlic, ginger, sugar and coriander powder. Heat oil in a pan and add the onion paste. Fry the paste for 5-6 minutes, till the paste gets cooked and the oil starts separating from the paste. Add the diced Pork/ Chicken and the shrimp and fry till the meat is thoroughly cooked. Add the diced carrot and scallions and fry for about a min Add the chicken stock cube and mix well. Add the cooked rice, salt and soya sauce and mix well into the meat and vegetables. Fry for 3-5 mins, till the rice,spices and vegetables are nicely mixed and the rice is thoroughly heated. Serve hot, garnished with a fried egg on top. For Vegetarians : Skip all the meat and substitute with vegetables like pepper, peas, mushrooms, cabbage or chopped fried tofu. 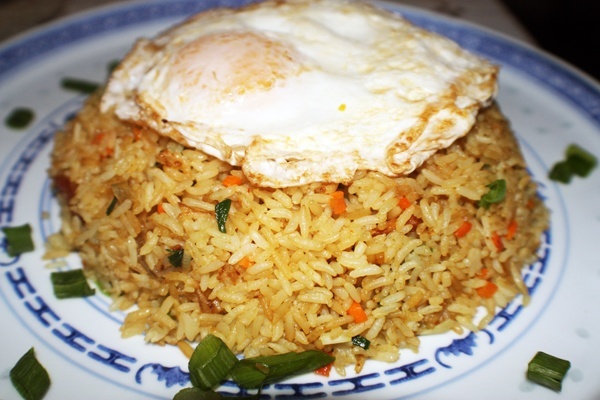 This entry was posted in All Recipes, Rice and tagged Nasi Goreng by Kamakshi. Bookmark the permalink.